Hi Guys, I have a common problem I think. I can tack plenty of pictures of parts goon bad, but have now answers. Should I post some images for you guys to tack a stab at? Start a new thread by clicking on "New Topic" under the "Printing" forum so everyone will see your question. This thread is specifically for the PTPG topic. Are those gaps in-between in the layer below? Thanks for the great content on this forum! Here are some images that may help this discussion. Can anyone help identify the difference in the printing between these two same objects? There are 4 things that cause that. 1. Extruder temp: Is it too hot? 2. Extrude length / Calibration: Did you install a new extruder? Perhaps a different size gear in the extruder? Maybe you sliced it with 1.75mm filament and used 3mm. 3. Slack: Are you printing with a different printer? The bearings may be loose or printed parts cracked causing wobble. 4. 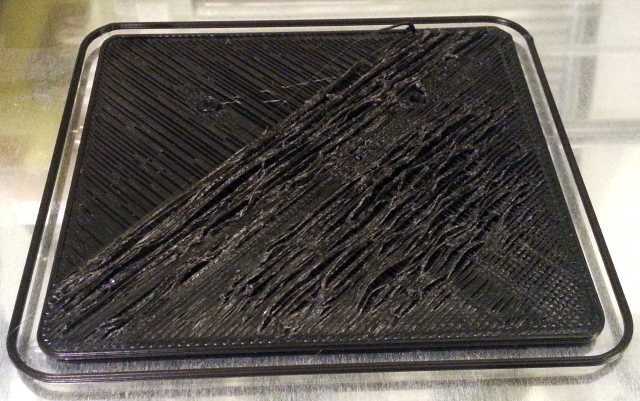 Infill: This can also occur with bad calibration of your extruder. Hollow allows your filament to spread out further. Solid puts too much plastic in one level pushing your borders out. I'm not including it in the causes, but there's a small chance of bad slicing software or firmware. Not likely. 1. To high temperature, maybe your termistor got loose. 2. 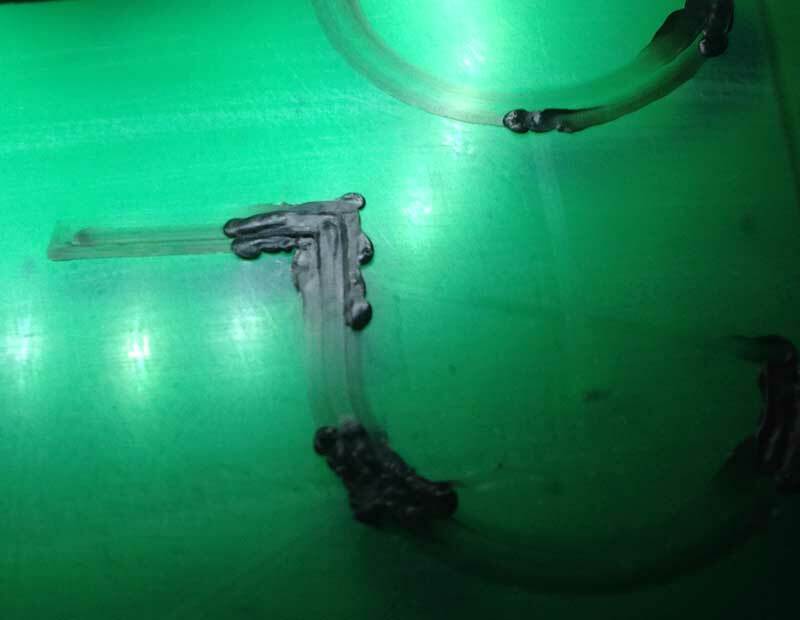 Moisture in your filament (the water will boil and steam), try top heat your filament in a oven for some hours. should be 10-15 degrees under glass transition temperature. PLA 60-65, so 50degrees will be okay. ABS is aroung 100, so maybe 80degree will be okay. Hey guys, I love the idea of a PTPG, I would use it all the time! I think sorting (indexing, hashtaging, rating) the mini-articles (green boxes on PTPG) is really important, so that we can apply filtering. Looking for a solution to a printer problem could feel like looking for a new laptop on for example pricespy. I think filtering interfaces with live updating list and count of matches is really effective. If someone likes the idea and know how to implement a minimalist version of this, I am very keen to help. 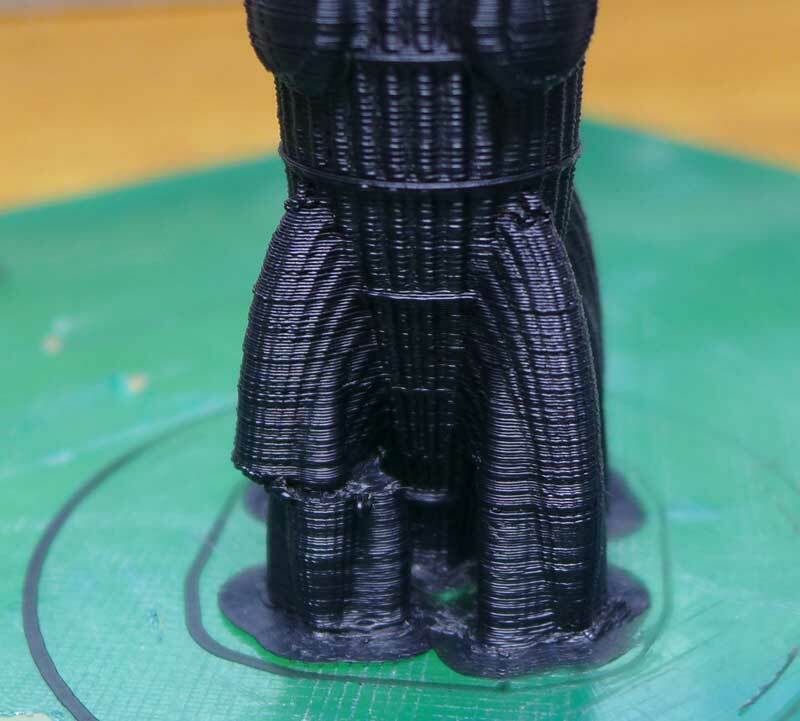 I'm thinking that inconsistent extrusion is causing the layering issues in my prints but I'm not sure how to fix it. I've tried loosening and tightening the extruder, hasn't improved. Any ideas or suggestions would be great. Thanks! (There are pics of two bottoms, tops, and a side from each cube I printed). The last 3 photos I changed the temps to 230/235 from 225/230. ABS 3mm. I have done this little web app. Take a look at my blog and at thes youtube clip. It's rather simple and mostly just a proof of concept. What do you think? Is it worth continuing to develop? In that case, what should I add/change? Hi again, now my Print Issue Solution Filter is up and serving. Check it out here! Obviously, there is a lot of tedious manual labour left, writing the actual articles to be filtered. I've tried to mimic the form of the green boxes in PTPG, so we don't have to rephrase everything. Other than that, I've tried to fill the need expressed by rrr7's in the first post here: "Just a more condensed knowledge base." I've written about it in a bit more detail on my blog. Also, check out the source code at github. What do you think? Is it worth continuing to work on? I've worked on it alone for some time now, and feel like I need some input. Well that's new. Just got my printer back up and running when I saw this on the build platform. This is a rocket with 4 legs, 3 of them printed perfect only one was displaced a bit. At first I had no clue how this happened but the part was a little too easy to remove so I think the bad leg came off and slid over a bit mid print. Normally I have no issues with items sticking well enough but my printer has been half rebuilt lately so I am still working a few bugs out. The problem i have is each thing i print, the first layer are larger that the other one. Also, we don't see it on the picture but the PLA is darker in the first layers. My printer is a Prusa I3. I'm printing with PLA 1.75mm and I have a E3D 0.5MM hot end. The temperature is a 215 and the bed temperature is at 0. This is caused by the nozzle being too close to the build platform. The nozzle is touching the glass and my extruder can build up a lot of pressure and you get little spurts of extrusion as it actually pushes the bed down on the springs a little. I use a small nozzle so the difference in a perfect height and too low is very small. Not wanting to sabotage this but there are so many possible errors and equal many reasons for them. Filament you are using is number one reason for all problems so not all solutions work to same problem. Of course. 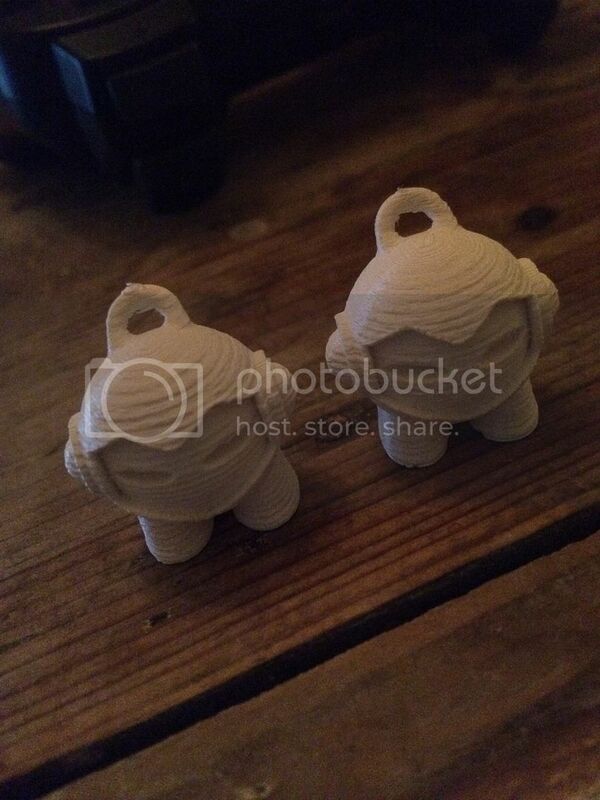 But these will give someone a direction to look into especially if you know you have a good filament supplier. Sometimes you just need something to start and a pictorial of common issues is a good start. If you're using Slic3er, open your configuration. Go to the Print Settings tab and click on Advanced on the left side. On First Layer it defaults to 200%, which makes the first layer twice as wide. This helps with getting your part to adhere to the bed. If you have a part with good contact, you don't need extra width so make it 0. Something with a good flat bottom like a box will adhere well on its own. If it doesn't, the extra width wouldn't help much. On small parts, though...they can break loose before the print is done. The extra width can be usefull to keep them attached. If you still see an issue, try spacing your extruder with 2 sheets of paper instead of 1 when you level your bed and see if that reduces it. Edited 1 time(s). Last edit at 08/12/2014 10:08AM by ltklein. Thanks for the information. the setting is at 200% I will try your recommendation asap. I'm already spacing my extruder with 3 layer of paper. please help me with this,..
i have a delta by my own design and have a printig issue i can not find the origin of the foult. That looks like PLA, yet I don't see a fan near your nozzle. You really need one to print PLA like this. I recently started a thread with a printing issue I had, before seeing this PTPG thread. 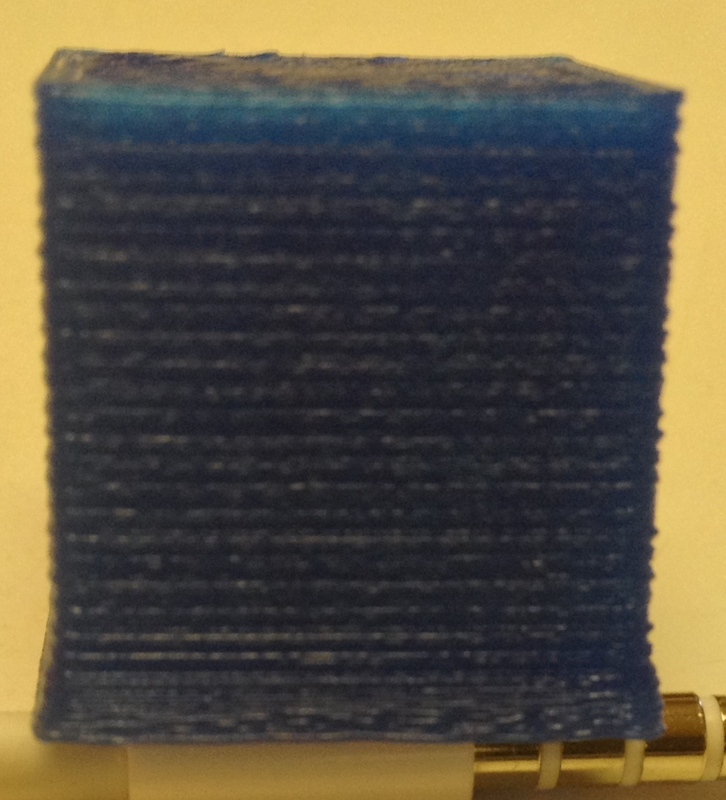 I have recently been encountering an issue of warping of my first layers, predominantly on my y-axis. I have a Prusa Mendel i2, and my heating bed is problematic, as it heats up only half the bed (roughly from y=80mm to the end of the bed). The issue I am having appears predominantly on the first layers. Does anyone have any suggestions on what may be causing this and how I could solve this issue (aside from buying a new heating bed which is on the way)? 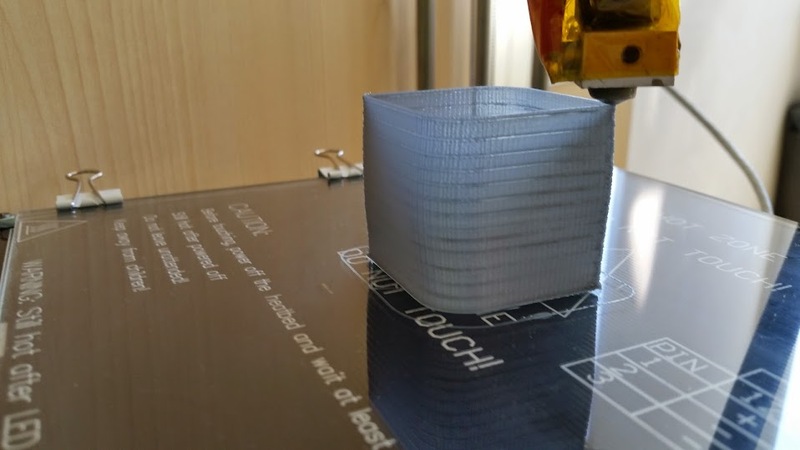 The print was made with PLA @ 187 Celsius, 0.2 layer height and Bed temp @ 50 degrees Celsius (which again is not exactly accurate as it is more like 70 on half of the bed and 25-26 on the other half so that the thermistor at the middle of the bed reads 50). Can anyone suggest any possible solutions to the problem? I think this thread should be a collection of common print faults in the wiki, perhaps this one here could be extended with new photos as problems crop up? my work place have blocked all social network, including flickr, why they block flickr @[email protected] ? Do you have a pla carriage? It looks to me like you carriage may be softening during long prints resulting in nozzle displacement. The displacement probably depends on how the filament is spooled. It may return to its original position when the printer homes again at the end of the print. 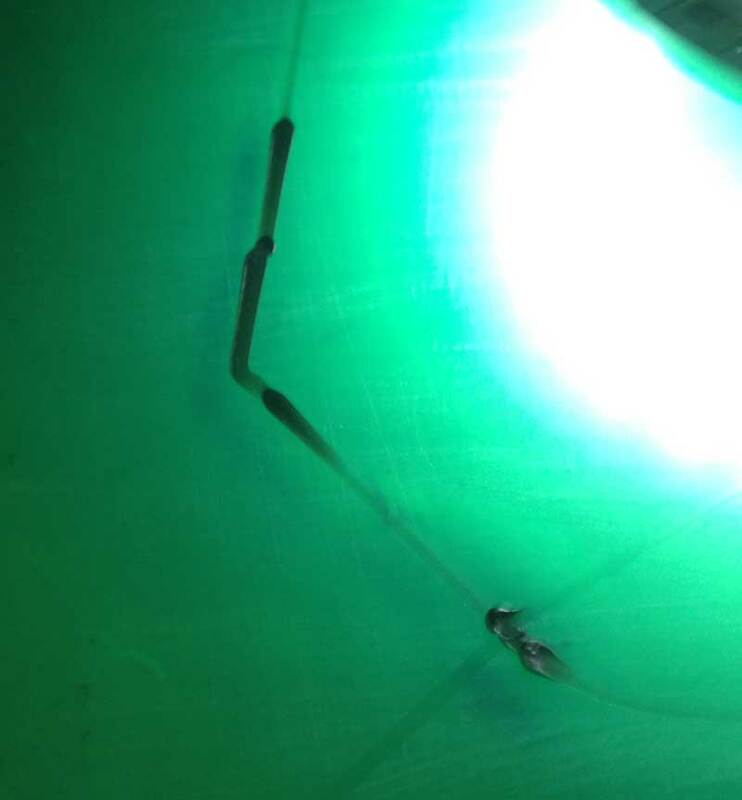 If that is your issue, the solution is some airflow around the thermal barrier of your hotend. 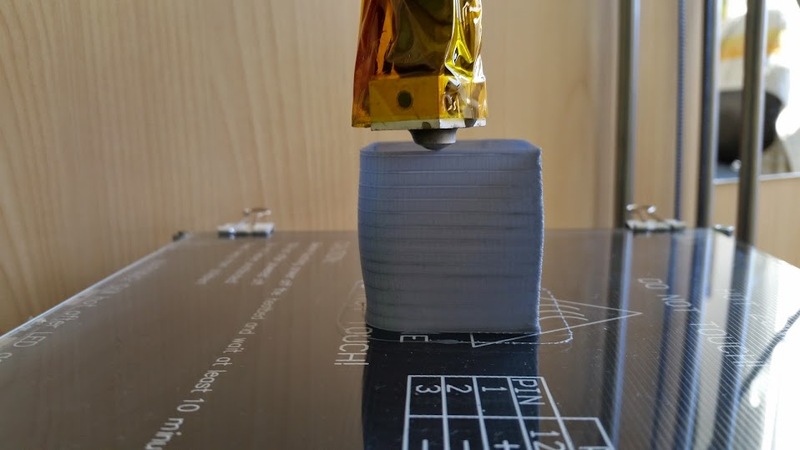 You will be amazed at how much that improves your print quality. I'd like to add my experience on print issue. My printer stopped to move after some times (1 ou 2 hours), or moved one line every minutes before stopping. The symptom was a "o" received in the log in place of a "ok". I tried 3 PCs, 3 USB cables without effects. "ok" was not mandatory in the comm setup. I finally changed the Mega carte from a Taurino to a Funduino I had for other project, and this solved the issue. I think there is a problem in the Taurino driver, specific to this carte. Funduino carte uses generic Arduino driver. Hope this may help: now I may surf and download models on my computer during printing (Core 3, 4GB ram, USB port at 115200). Just build a Prusa i3 Hephestos printer this weekend and my layers are wobbly in a consistent way.. Can anyone explain the reason?